My husband and I just got back from an 8 week long stay in France with our son. He was 6 months old when we left, 8 months old when we got back. The trip itself was quite the journey, with one 4 hour long flight, a layover in Toronto and another 7 hour long flight to Paris. 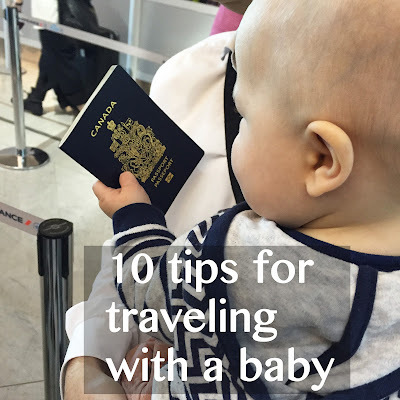 Everything from the flights to adjusting to jet lag went really well and I figured I would share a few useful tips if you're about to travel with your little one. 7/ Jet lag - we had an 8 hour time difference to deal with and it only took a couple nights both times. Babies adjust a lot more easily than we do. Just follow their lead, feed them when they're hungry, let them sleep, be patient, let them play quietly for a little while if they wake up in the middle of the night, read a book and rock them back to sleep, etc. Last but not least, don't stress too much. It usually goes much better than you think it will. Most people are very understanding and babies will adapt to almost any situation.